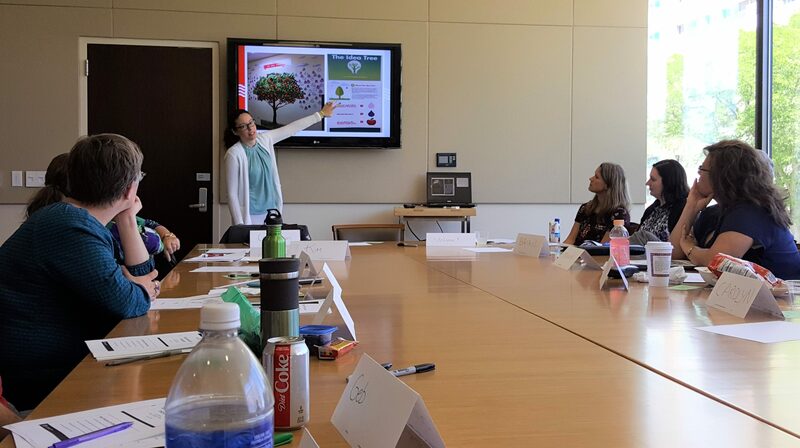 Cori Splain from the Office of Student Financial Aid explains an Idea Tree at the June 2018 WiCi event. The November 15 WiCi brown-bag event, Business Process Modeling and Notation (BPMN) for Process Improvement, introduced BPMN as a standardized symbol set for modeling processes. The session was led by WiCi member Joe Goss from the Office of the CIO’s Project Management Office who explained how these symbols can be used to represent the steps and flow in a business process. Participants also learned about Lean wastes and how they help us recognize process inefficiencies. What is the WiCi Network? The Wisconsin Continuous Improvement (WiCi) Network is a university community of practice that was formed to bring together anyone involved in or supporting continuous improvement efforts across campus, or anyone interested in learning, sharing ideas, or networking around the work of continuous improvement. The Administrative Process Redesign (APR) unit was a sponsoring organizer of the WiCi Network, but the community has not been limited to those involved in APR projects. Whether you are actively engaged in an improvement project, assessing how to bring continuous improvement to your unit, or just interested in learning more, the WiCi Network has a lot to offer. The WiCi Network hosts multiple events throughout the year that focus on topics relevant to the practice of process improvement. Some examples of recent event topics include Project Selection, Creating a Project Charter, and Optimizing Your Networking Skills. Anyone is welcome to attend and learn first-hand what the community is about. Program and registration information is posted to this website and provided via email to email subscribers. To ensure you receive information about WiCi and future events, subscribe to the WiCi email list.